Kieran trippier is a professional footballer currently playing for the English club Tottenham and the England national team. Born on 19th September 1990, Trippier has represented his country at all levels from under-18 to under-21 and the Under-20 2009 FIFA World Cup. While playing for Championship club Barnsley, the attacking right back was named in the PFA team of the year for two consecutive seasons in 2012-2013 as well as 2013-2014. Footballing days started early for the prodigy, who joined Manchester City's youth system at the age of nine. Rising quickly through the ranks of the club, Trippier became a regular in the reserve team in the 2007-2008 season. He was part of the youth team that won the FA Youth Cup, but could not break into the first team of the club. Trippier appeared on the international platform when we was called up for an Under-18 friendly match against Ghana in 2007. He then went on to represent England in the 2009 UEFA European Under-19 Championship and the Under-20 FIFA World Cup. Trippier had to wait till 2010 for his professional debut when he was sent out on loan to Championship club Barnsley. He debut came in form of a 2-1 defeat from Middlesbrough FC. Trippier made only 2 appearances after that as his loan spell was cut short due to an injury. Following a three match loan spell, Trippier was sent out on loan to Barnsley again where he remained till the end of 2010-11 season. His first goal came in form of a curling free kick from 25 yards in a 3-3 draw against Leeds United. 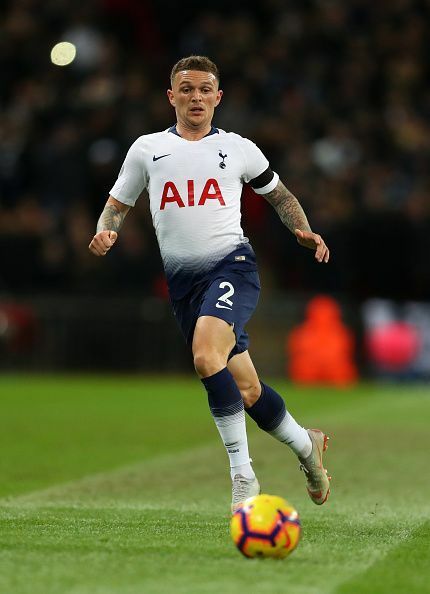 At the end of the season, Trippier had made 41 appearances across all formats and was the recipient of the Young Player of the Year award. The next season saw him being sent out on loan again, this time to another Championship club Burnley. Although the club finished in the middle of the table, Trippier managed to turn heads on the 46 occasions he appeared on, winning the Player of the Year award of the club again. Trippier’s association with Barnsley continued in the 2012-2013 and 2013-2014 seasons as well, where he continued to impress with his performances. While being named in the PFA team for both years, Trippier also carried his team to the second place in the points table in the latter season, thus earning the promotion to the Premier League. Tottenham came calling in 2015 and bought him for a sum of 3.5 million pounds. Although he only managed to appear on 6 occasions in the Premier League, he played every match Europa League. The 2017-2018 season saw him cementing his spot in the first team as he continued to dazzle with his performances. His one of the most memorable performance came in the 3-1 victory over La Liga giants, Real Madrid in the 2017 Champions league. Opinion: There is something wrong with Kieran Trippier - but why?